This is a statue. It resides in The Israel Museum in Jerusalem, and spells out Ahava (Love in Hebrew), somewhat artistically. The design became famous, and can be found in Hebrew jewelry and tattoos all over. Incorrect to one degree or another, usually. In an older entry we saw this same design mangled beyond all recognition. In this one, you can tell what it's supposed to be, but it is still misspelled. It doesn't spell out Ahava, but rather Achbach, which really means nothing in Hebrew. See, many Hebrew letters are very similar in appearance. For example He, which produces the HA and the last A in Ahava, is quite similar to Chet, which makes a CH sound. The statue has borderline rendition of the letter He, but the tattoo totally crossed that border. In the Hebrew language, every little stroke can turn your chosen letter into something else entirely. Want your Hebrew "Ahava" (Love) statue-like tattoo correct? This is How you'd write it in proper Hebrew. It's really supposed to be all in one line, but we're being artistic, yeah? There's a reason for this, actually. How would you write out ahava if it was all in one line. Also, I know hebrew is read from bottom to top bit is it read left to right or right to left? I always thought this sculpture said Brother and some sort of gibberish underneath, and I never could figure out why. Now it makes sense. Those letters are not ח. The sculpture would just not stand upright, were the gaps there. And it is written as two word for artistic reasons. Actually, this can be read literally as two separate words - אח = Ach = brother and "בה" = Ba = in her, inside her. The statue itself is okay. 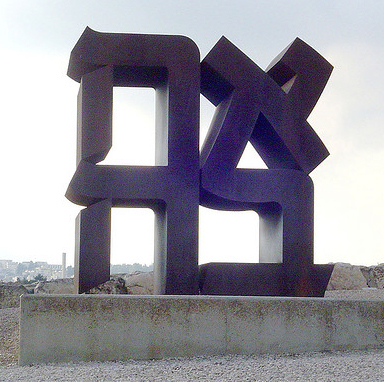 From a better angle (there are other pictures on the web), you can see that the left leg of the ה is a distinct wedge, although it may be a bit connected to the top stroke for structural reasons.